Birkby Bitter is a Copper coloured ale that has a soft malt flavour and light hop bitterness. 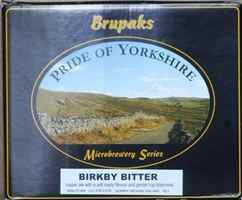 A two can kit from the Brupaks Pride of Yorkshire Microbrewery Series which produces 40 pints of easy drinking, copper ale with a soft malty flavour and gentle hop bitterness. The bitterness can be enhanced by using the bag of hop pellets supplied with the kit to make a "hop tea" which is added during the primary fermentation stage.